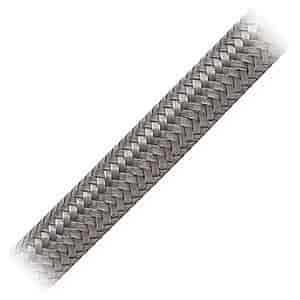 Auto-Flex HTE Stainless Steel Braided Hose is to Earl's specifications as a competitively priced alternative to substandard imported stainless hose while still offering the qualities of a premium product. This hose features a continuous use temperature rating of -40° to +300° F with maximum operating pressures equal to Earl's Perform-O-Flex Hose. It has a partial coverage textile inner braid in the HTE inner liner and a full coverage stainless steel outer braid that's bonded to the reinforced liner. Hose Sizes: -4AN (1/4"), -6AN (3/8"), -8AN (1/2"), -10AN (5/8"), and -12AN (3/4"). Hose Lengths: 3, 6, 10, or 20 feet. Note: Auto-Flex Hose is intended for use with Swivel-Seal, Auto-Fit, Auto-Mate, or Auto-Crimp Hose Ends only. No other Earl's Hose Ends are intended for use with Auto-Flex Hose, and the use of other manufacturer's hose ends is not recommended.